Residents in the village of Gourdon in the Provence, France in Europe love to adorn the exterior of their homes with flowers. Locals love to have lush, beautiful gardens where they grow an abundance of different varieties of flowers in the village of Gourdon in France, Europe. 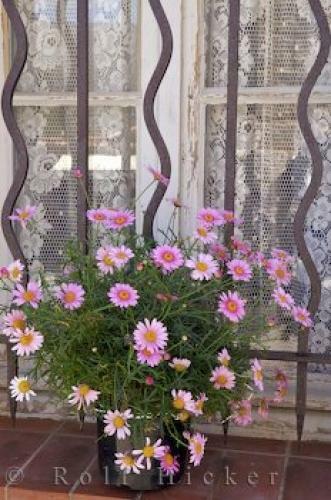 A local resident picked these colorful flowers from their own garden to put in a pot outside their window to add luxurious colors to their home. Very few houses in the village of Gourdon in France, Europe do not have flowers growing up and around the exterior of their home. The climate in Gourdon, France is ideal with a great amount of sunshine and the flowers seem to flourish naturally with a touch of tender loving care. Flowers in pots on a window sill in the village of Gourdon, Alpes Maritimes, Provence, France, Europe. I photographed this photo with the digital SLR camera model Canon EOS-1Ds Mark II, aperture of f/14.0, exposure time of 1/8 sec. on ISO 100, as always I used a original Canon Lens, the focus lenght for this picture was 57mm.